Turkey vests for hunting is a category of clothing that is intended specifically for use by hunters. This item has an unchanged popularity among hunters thanks to a combination of features such as functionality and ease of use. Typically, a hunting vest provides a large number of pockets, compartments, loops. Due to this, the hunter has the opportunity to carry various accessories at his fingertips, and if necessary, quickly get and use them. 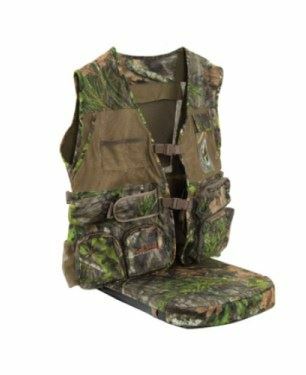 At the same time, thanks to the lack of sleeves, the vest provides maximum freedom of movement, which positively affects the willingness of the hunter to make an accurate shot. The vest should be selected according to the type of camouflage in accordance with the peculiarities of the hunting area and the camouflage of the rest of the clothing. Modern vests are available in winter, summer, mid-season options; lightweight, ventilated high-strength fabrics designed for hard use in natural conditions. 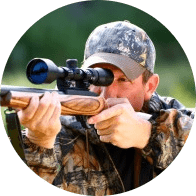 If you are going to purchase hunting vest for turkey then pay attention to the following items we consider the best on the market. 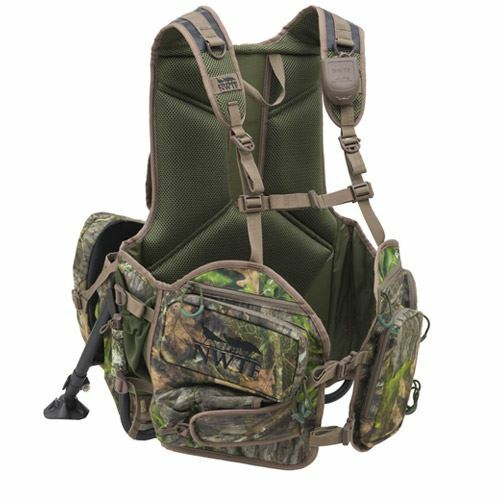 The NWTF Grand Slam Turkey vest features “sit anywhere” kickstand frame, thick padded fold away seat, a smart-phone sleeve and a removable diaphragm call pocket. The vest also includes shell loops, H2O compatibility, side compression straps, two water bottle pockets, detachable shoulder straps and a protective silent box call pocket. Due to the removable kickstand frame paired with a padded seat you can sit anywhere in a comfort. There are shell loops, two water bottle pockets and detachable shoulder straps. 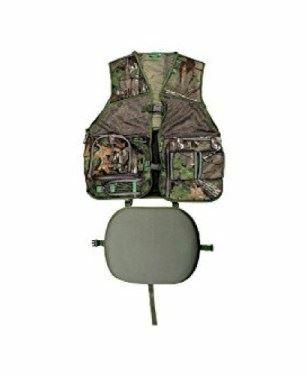 The vest is made in different sizes and camo patterns to fit various types of hunters. Swivel feet prevent sinking. The vest can be a bit bulky if you run. The Gobbler Vest Gen 2 is the greatest vest for turkey hunters who desire it when it comes to comfortable concealment, smart storage, and durable construction. Useful and quiet pockets keep everything you need organized and in easy access, including extra pockets for four pot calls, mouth calls, decoy stakes, and other gear. The vest includes zippered pockets. There are molded pot call pockets, which hold two pot calls. It also includes mouth call purse pockets and decoy stake pocket. There’s a back padding for a comfortable sit against any tree. 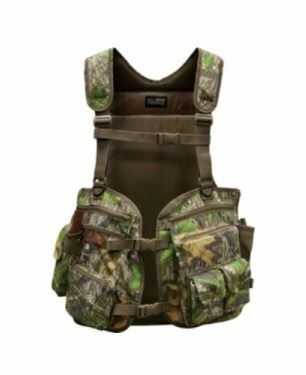 The vest is available in Mossy Oak Greenleaf and Realtree Xtra Green. The sizes differ from what they should be as the biggest size runs to big while the small one fits smaller. There’s also a problem with vest’s straps. The design of NWTF Impact Vest represents a versatile, lightweight, sit-anywhere hunting vest. It has different pockets for a variety of calls. 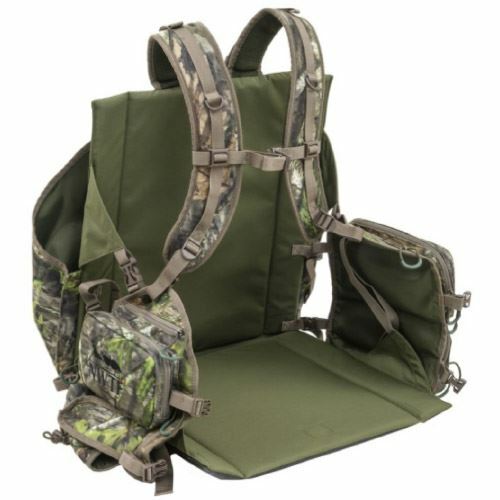 A removable front pocket features a shoulder strap for run-and-gun type of hunts. 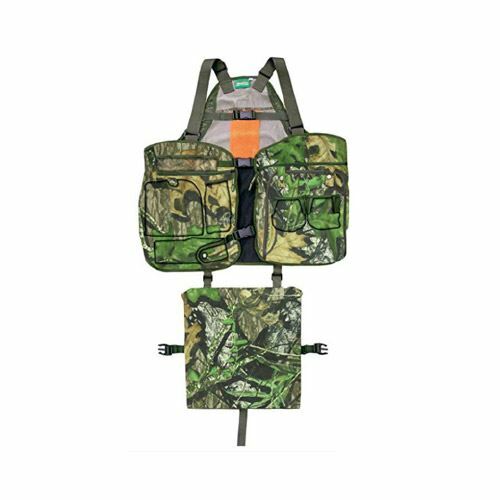 The Impact Vest also includes a game bag on the back, which has a pocket for decoy stakes. Brushed Tricot fabric is durable and prevents noise. Thanks to camo patterns hunter can blend into surroundings. Unique fabric is designed to help stay soundless in the woods. A removable seat design with easy adjustable straps fit variety of sizes. 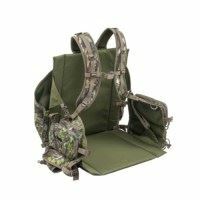 There’s removable front pocket with shoulder strap for run and gun style hunts. 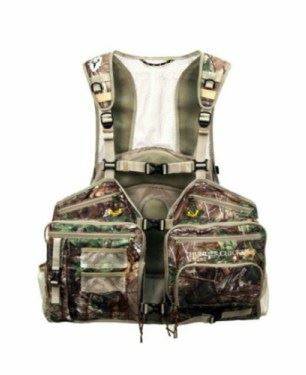 The vest is equipped with a variety of call and striker pockets, shell loops and game bag. The vest may run big and it makes to feel uncomfortable. The shoulders are also wide in this case. The Midway USA Full Strut Turkey Vest makes any hunter to have great and comfortable experience. Thanks to 14 pockets, there is enough space for all turkey hunting gear. Shot shell holders, box call pocket, three mouth call pockets, map pouch, two padded friction call compartments, striker holders, a huge game bag and many other zippered pockets. A game bag on the back makes transportation of decoys easy, and the padded back adds comfort against oak trees. 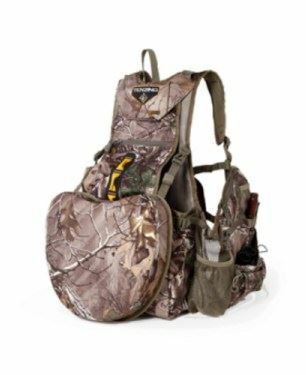 The padded shoulder straps allow carrying gobbler out of the woods in comfort. It can be bulky for someone. The vest’s padding in the back can make you sweat. NWTF Super Elite Turkey Vest by Alps Outdoorz meets every turkey hunter’s needs. It features 22 pockets including two large slate call pockets, three striker pockets, a box call pocket, two mesh diaphragm call pockets and an easy access cell phone pocket. There’s a removable 2.5 inch thick fold away seat, which allows to sit anywhere. A blood proof breathable game is included for carrying. The Super Elite 4.0 is made of a quiet cotton liner and breathable mesh panels. Hunter can pack everything in the 22 pockets. Easy access to cell phone in the front phone chest pocket. Blood proof breathable game bag included for all carrying needs. It is available in multiple sizes. The vest can run a little small and makes feel hot. Primos is recognized for its high quality turkey hunting gear. This vest has enough pockets for everything. It also features a large back pocket which allows easily take the bird out of the field. The seat cushion is removable so you can take or leave it. It comes in multiple sizes so everyone can choose an appropriate one. Tree Hide shoulder pads reduce the weight of loads. Pockets are made for specific calls to keep gear organized. Molded foam striker organizer keeps striker tips with 6 slots hold strikers, shells and call conditioner. Detachable cushion with clip buckle provides comfort while hunter waits. Cushion is not that good and small. The vest runs too big. Wearing this vest you can carry all you need and feel comfortable wearing the vest for long periods of time. The straps are adjustable, which makes it easy to adjust for definite size. The vest is lightweight. The zippered, expandable mesh pockets allow extra stuff to put in. It provides freedom of movement. A seat pad is also provided, to help hunter wait in a comfort. Zippered pocket with 6″ expandable mesh pockets on the inside can be used for different small gear. A cinch strap holds vest tight to body and adjustable straps provide the best fit. Pockets are designed for specific calls to keep it organized, including a striker organizer pocket and mesh pockets. There are detachable foam cushion and orange safety strip. Vest may be a bit oversized. The seat pad is a too thin. A few more Velcro straps are required for this vest. Whitewater Thunder Chicken Turkey Vest has padding, pockets and features that hunter wants the most. Manufacturer pays attention to make specific pockets for turkey calls and other gear. It also has a built-in blaze safety flag and mesh panels for ventilation. It features a water-resistant, ground-gripping, fold-up seat and a stain-resistant game bag. Vest features detachable contoured large seat. The cushion is made with combination foam for comfort. Seat has water resistant bottom with PVC gripping material. Padded shoulder straps with d-ring gear loops. There are 2 box call pockets, 4 zippered slash pockets, 2 slate call and striker pockets, 8 diaphragm pockets and 2 large fold-down pockets with extra pockets within. Some claims it has poor design that it is not enough durable. The fabric also seems too thin and cheap. This great turkey hunting vest by Hunter Specialties really meets the requirements of turkey hunters. There is not too much information that manufacturer provides about this product. However, there’s a lot of positive feedback who claim that it worthy you spend money on it. The H.S. 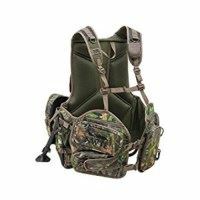 Strut Turkey vest comes with a range of pockets and pouches of different shapes and sizes. There are a couple of large pouches which are useful turkey decoys. It provides enough space for body movements. It has a robust finish, and the camouflage pattern is helps to blend into any background. The sectioning of the pockets is not smart. It can be uncomfortable to wear sitting for long time. The TZ TV14 Turkey Vest provides pockets for calls, chokes and shells. There are pockets for box, slate, trumpet and diaphragm calls that you can quickly reach to. It comes with a foldout padded seat for comfortable time to spend during turkey hunting. There are a lot of specialized pockets to store hunting gear and have easy access to them. The materials and the construction are high-quality. The vest has an internal aluminum seat, which is rustproof. It features a thick padded seat. The vest comes with spring-loaded, adjustable legs. The internal padded waist-belt, the padded backrest, and padded shoulder straps add extra comfort while you wear it. There are problems with the seat. If you want to sit down then you have to take the whole vest off. It also may be a bit noisy when you walk. A hunting turkey vest is necessary for the hunter to ensure that all necessary trifles are always at hand and evenly distributed by weight on the hunter’s body. 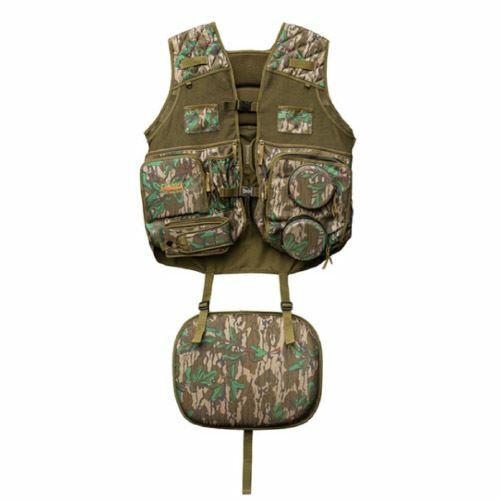 The vest for hunting has a lot of pockets of various capacities and built-in pouches. Hunting vests of differ with its strengthened shoulder by a softening non-slip patch, which protects the hunter from the effect of recoil. The protective color of the vest provides additional camouflage during hunting. However, it has the main disadvantage as the presence of excess weight, especially when you walk a few kilometers on foot, and every extra kilograms turn out to be a burden. This is very significant for a successful hunting. Any hunter strives for comfort as one of the most important issue. Turkey hunting vests as other hunting clothes and gear has to be comfortable. It has to spread the weight evenly, so the shoulders and back won’t be overloaded and hurt, it is especially important if you have to walk long distances. Most of vests include a seat, which adds great comfort while hunter waits long time. Some seats also have a back support. It really that makes hunting pleasant but such models tend to be rather expensive. Material is another aspect you should consider. The material can make vest to be heavy or lightweight and also durable. 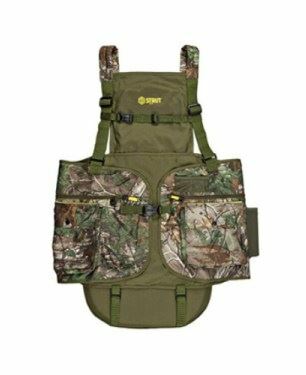 The best turkey vest as any other should have enough quantity of pockets for storage hunting gear. There should be inner and outer pockets of different sizes. Choosing such vest depends on how many things you take on hunting and whether you really need them all. Large pockets are made to carry bulky gear and small pockets are for calls, etc. Make sure that the pockets are easy to use and you can quickly reach the necessary equipment. If there’s not going to be at least 2 calls for turkey then don’t look for vest with too many pockets. Look for the vest, which different pockets in size, for example, the large one you can use for rangefinder or binoculars, and the small one for call, etc. Single compartment pockets won’t be very useful so avoid them. Vest should include pockets for ammo. Hunters often carry decoys so it’s great if vest has a pocket to fit it in. The pockets of the vest have to feature zippers, Velcro closure or magnetic. It is better to prefer elasticized compartments as hunter can avoid unnecessary noise. Probably none of the hunters want to be noticed while hunting and chasing the target. Turkeys have great vision and ability to notice bright colors from a long distance. The effective camo pattern can be gray or brown, which is better to choose for mid-season hunting. At the end of spring give preference to green camo to blend into surroundings successfully. Turkey hunters have to worry about safety especially. Modern turkey vests include a removable blaze orange safety flag. It helps to make hunter visible for other hunters to avoid any dangerous events. These vests also come with a huge-capacity game back at the back. This allows carrying the turkey you have shot secretly from other hunters. It can be also used for turkey decoys. Survival kit. Every hunter must know own ailments well and take the appropriate set of medicines. General medical products should include drugs that can treat heart attacks, scrapes, burns, frostbite (during winter hunting), bruises, dislocations, fractures and wounds. To the set of medicines, hunter should add rubber bands for stopping blood, bandages, cotton wool, iodine, plaster. Knife. Hunter should have at least two knives. One should be folding knife, with extractor for extraction, with a fixed blade length of about 8 cm, can opener, screwdriver and bottle opener. The knife should be with a loop for attaching to the belt. The other knife should be clumsy, with a blade no more than 150 mm. Turkey Calls. The calls of the turkeys are important, as they bring the hunter closer to the target and allow making a well-aimed. Having at least three calls allows hunter to use them for the desired purposes. Turkey Decoys. Decoy is another way to bring the hunter to the turkey. It allows the hunter to stay hidden. There are great varieties of real-like decoys that move and even can produce sound to make turkey interested. Bottles. For a one-day hunting you can get a thermos, best of all metal. Items for locations. You may easily get lost so make sure you have devices for communication (walkie-talkies, since mobile communication is not everywhere), GPS navigator, compass or map. Ammo. Buckshot and shotguns are the best choice for hunting. Fraction is great option if you hunt some bird like turkey, or small animal. Hunter Orange. There is always should be hat, vest or other safety wear of blaze orange color, which hunters have to wear while hunting in most states. There are vests with a built-in blaze orange flag to make yourself noticeable for other hunters and avoid accident. Insect Repellent. If you are going to hunt in a swampy area, then you need to take with you an insect repellent to protect from dangerous bites, especially in summer time. Since hunter puts a lot of stuff into the vest, it is used very often and regularly, so you won’t escape the dirt, spots, etc. It is important to keep the vest clean and minimize the spread of bacteria so it is recommended to wash after hunting session or at least after second one. Make sure to wash your vest using gentle cycle with cold water. Turn the vest inside and out, wash it with a friendly detergent, which is scent free. When the vest is dry, hang it in a cool, dark place. Primos Hunting. It produces game calls for deer, turkey, elk, waterfowl and other same as clothing and accessories. Every member of Primos Hunting team likes to hunt and therefore uses all of the gear to see whether the items are effective and useful. Alps Outdoorz. This brand spends a lot of time and put efforts to make first-class gear for hunters. The items are tested, used and modified, to provide hunters a reliable, durable, and practical gear. The gear has innovative features that make hunting comfortable and enjoyable. Hunting Specialties. This brand offers deer calls, archery items, and a great variety of essential hunting accessories. Hunters Specialties does not stop to produce innovative gear that makes hunting efficient, effective, and successful. This is obvious that the vest is not only comfortable clothing, but also a multifunctional item. It should be understood that the vest is not universal, and its use depends on certain conditions. Choosing a turkey vest remember that there shouldn’t be rubbing stitches. All models are made without exception on detailed thought out patterns. No matter how the hunter moves, he doesn’t have to experience even the slightest feeling of discomfort. It should provide good air exchange. Fabric and filler materials simultaneously keep heat, and provide normal ventilation. This feature is very important for the summer vests. Do not forget about optimal location of pockets, compartments. What also matters is camo pattern. There are both monochrome and camouflage models. Vests with a camouflage pattern are produced in a large number of variants, for different landscapes and seasons.